Mountain boarding is one of the most demanding extreme sports physically, but equally fulfilling at the same time. Terrain extreme sports have evolved tremendously with new technology and gear, and we are now seeing new sports emerge because the appropriate gear is now available. If you ever wondered what it was like to roll down mountains at high velocities, you can experience that now thanks to mountain boards. However, before you start investing in a mountain board, you have to realize that there will be countless falls, every now and then. Hence, getting an expensive board to cover your long term needs won’t actually do you any good unless you already know mountain boarding. Let this guide help you get started with mountain boarding, buying the ideal gear, and keeping other things in perspective that can help you progress! Buying the right mountain board will help you learn the sport more conveniently and you will likely stick to it as a result. 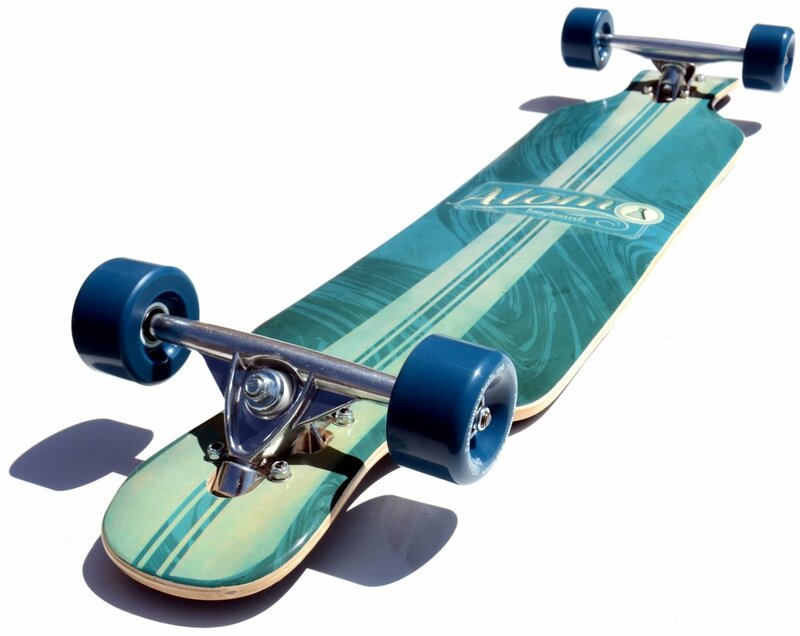 As it is, mountain boards are available in various sizes, shapes, and specs. You can get beginner boards for kids for less than $100, and upscale mountain conquering boards anywhere between $100 and $500, or more. Ideally, when you’re presented with a wide range of mountain boards to choose from, you should first learn about the different accessories and functions in a mountain board. Additionally, your choice will also depend on whether you prefer free riding, carving, freestyle, or big air. DECKS: The most important consideration for a beginner is the length of the deck. Generally, small boards are for little people, and big boards are for tall and big people. For a child, an 80cm deck is ideal, but for a 6 feet tall adult, you should look for a deck no less than 100cm. Longer decks add stability, which is why it is important to buy the right deck size to make the learning easier. Another important consideration in decks is the construction. Although it’s not something to worry about for a beginner, but as you learn mountain boarding, you may want to step up your performance with a high grade deck that is more than plain wood. High performance decks feature Reverse Cap Construction that is quite similar to what is used in snowboards. Woven Kevlar mountain boards are also ideal for durability and resistance. Get the deck size right for your height and if you have to spend a little extra for a high performance deck, then so be it. 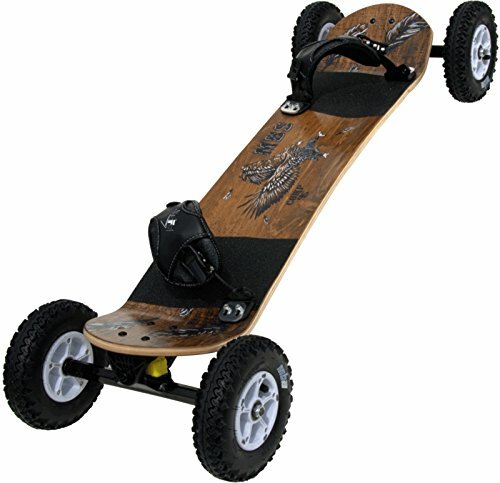 TRUCKS: Essentially, there are two different types of mountain board trucks that you will find for beginners. The most common style is skate truck, followed by channel trucks. 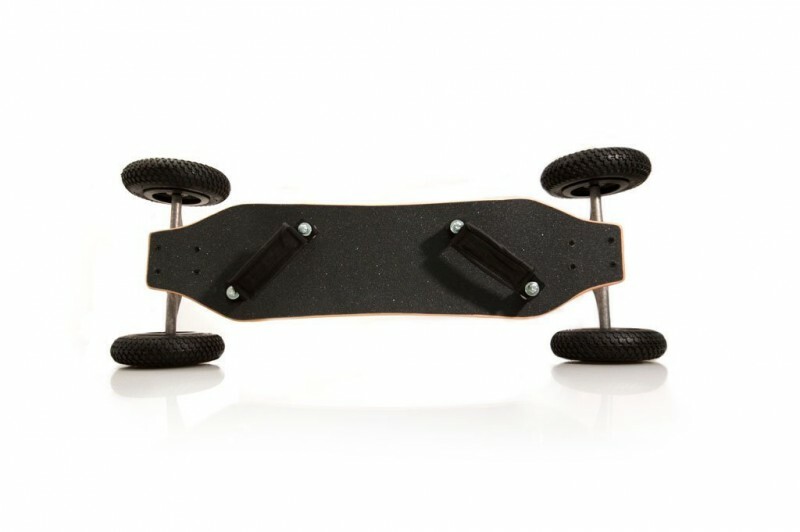 Skate trucks are quite similar to trucks featured in skateboards, but they have more weight and sturdier construction to handle rough terrains and allow longer axles for bigger wheels. 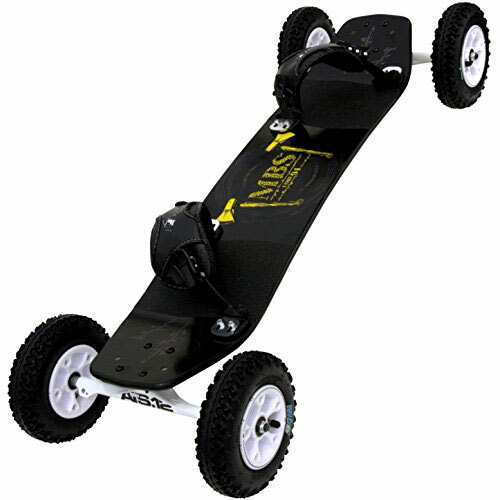 These trucks are commonly available in affordable, lightweight, and small mountain boards. The best thing about skate trucks is that they help you learn how to turn while mountain boarding. Channel trucks, on the other hand, feature channel-shaped axle that bolts horizontally on a hanger. It also has dampers and springs to control the truck movement. In some channel truck mountain boards, you can even adjust the movement from light to stiff and vice versa. Channel tricks are commonly used by beginners and pros alike for added adjustability and stability. Skate trucks are great for beginners, but so are channel trucks. If you plan to buy a high end mountain board later, you can do quite well with skate trucks in the beginning. BINDINGS: You will be surprised to know the sheer variety in just about all parts of mountain boards, despite mountain boarding being a relatively new sport. In bindings, you have the choice between plain Velcro straps, adjustable ratchet straps, and snowboard bindings among others. Nevertheless, bindings work in more or less the same way. Which binding you choose is ultimately down to what type of mountain board you have bought. However, bindings are always upgradeable and you may find better bindings for your mountain board from the manufacturer’s website. While bindings offer similar functionality, if you have purchased a noSno mountain board, then you should only upgrade the bindings to noSno Softs for added security. WHEELS: Lastly, getting a mountain board with a good pair of wheels will always improve your performance. Most mountain boards are equipped with 20cm wheels in diameter. When it comes to options, you have a plethora of variety to choose from. This includes sturdy metal hubs, 9 inch tires, plastic hubs, and so on. Ideally, buy a spare pair of wheels that can fit in your mountain board after a month or two of practicing. For beginners, the standard plastic hub wheels are the most practical wheels. However, you should keep a pair of different wheels or tires to try out what suits you better once you have learned mountain boarding. Once you have familiarized yourself with the gear, the next thing to do is discover your preferences. 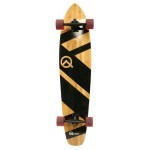 Most mountain boarders prefer freeriding, and buy mountain boards that are sturdy to deliver the performance they want. Here are some types of mountain boarding you may take up, so look for a board that meets the needs. As the name suggests, free riding involves riding in an open environment. Freeriding can be done on single track trails, ski resorts, big mountains, and backcountry. Look for mountain boards with 9 inch wheels for smoother carving across rough terrains and brakes that are more inclined towards safety and movement control rather than speed. Carving involves high speed riding with precision carving and is the essence of all boarding sports. Look for boards with super grip traction in pneumatic wheels that allow you to carve deeply with precision while the Matrix trucks give you the ideal rebound for the next turn. Boarder X is a racing competition on dirt tracks that are filled with rollers, berms, and of course, jumps. If you want to get into Boarder X, look for a flexible speed oriented mountain board. Ideally, you should invest in a board that has Matrix trucks that allow precision in carving. Big Air is exactly what you see in X Games Big Air Stake or Snowboard competitions. Going big on mountain boards requires you to have a board that has enhanced take-off and stiffer deck for landing successfully after air time. Freestyle mountain boards will be similar to an extent to big air mountain boards. Freestyle riding involves all types of riding, including rail jumping, sliding, and much more. For freestyle boarding, you should choose a lightweight mountain board. Land kite boarding is fairly knew but a popular activity in mountain boarding. While it is difficult for beginners, once you have learned the basics, you can buy a mountain board with one-part power kite and one-part mountain board. Kite boarding takes you from the mountains to the clouds in a matter of seconds, so ideally choose a durable and sturdy mountain board for that. To give you an idea of what type of mountain boards are practical for beginners, we’ve chosen five that we believe are the best in our opinion for someone who has just taken up mountain boarding. This amazing entry level board from MBS has a lot of the same features as the more expensive offerings, such as Genuine MBS T1 tires with specially formulated high-rebound rubber material. A recent change to this model upgraded the axels from 9.5 to 12mm which makes it more comparable to the rest of the MBS line. This MBS Mountainboard is perfect for entry level mountain boarders who are interested in freestyle. The beefy maple deck and F1 bindings make it a very smooth board to ride on. The 8 inch knobby tires give you enough freedom of movement on rough terrains. It weighs 16.4 pounds to improve stability and features the classic ATS Trucks. If you are looking for an entry level hybrid crossover between a skateboard, a long board, and mountain board, then you won’t find many models better than this one. Currently one of the most affordable crossover mountain board in the market, SDS has truly outdone themselves with this 32-inch of performance oriented board. 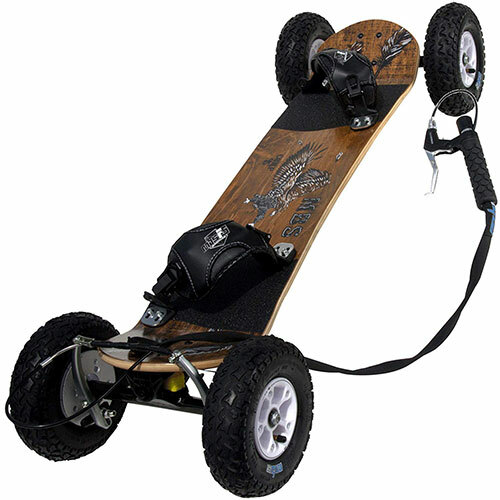 It features 8 inch tires and comes with bindings, straps, and all other hardware that can easily be assembled into a practical and affordable mountain board. This is another MBS Mountainboard that is becoming a hot property in entry level mountain boarding. Ideal for teens and adults, the Comp 95 features a 36 inch deck and weighs only 14.7 pounds. MBS ShockBlock truck suspension lets you custom tune your turning resistance. The Matrix II channel trucks are ideal for riding on all terrains whereas the configurations of the board make it very practical for freestyle riding. Overall, another top drawer Mountainboard from MBS. Last but not the least; we have the Comp 95X MountainBoard, the most in-demand entry level board that can take you places. Featuring a beefy deck and an enhanced V brake system, the board offers comfort, style, and performance, all matched well with freestyle riding. It features ATS trucks and knobby 8 inch tires that allow you to roll down mountains and easily maneuver around by shifting your body weight! When choosing from the best mountain boards available, you should always remember that there are hybrid models available that give you more versatility. For instance, an ATS long board can give you the flexibility of cruising on roads and rolling down half pipes, as well as taking on mountains and carving your way downhill. 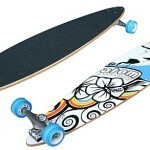 Long boards and mountain boards have many things in common, including the deck length, wheels. When it comes to extreme sports, you have to realize that no matter how good the gear is, it is ultimately down to the athlete. Hence, if you are passionate about speed, conquering terrains on wheels, and watching the great view in front of you from a whole different level, then it won’t be long before you become a pro mountain boarder. 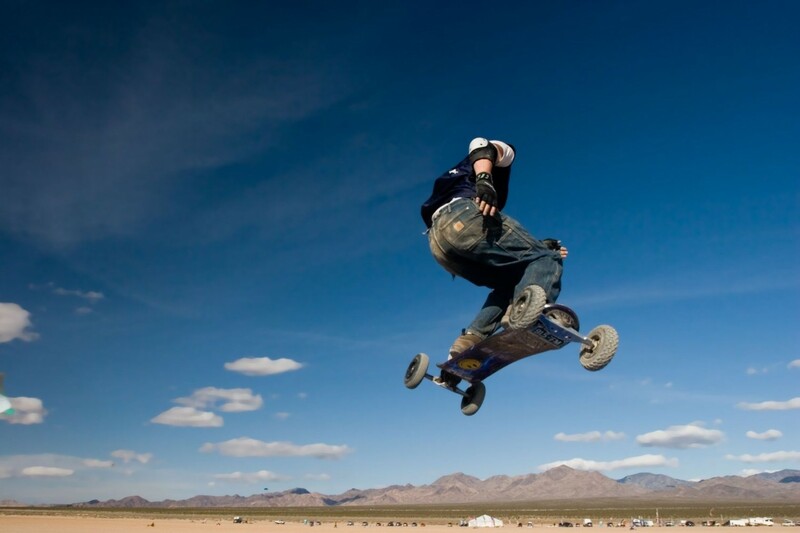 Mountain boarding is quickly becoming one of the major extreme sports in North America and other parts of the world. Although it is still a relatively new sport with more or less, a decade of history, don’t be surprised to see mountain boarding becoming a mainstay in the Summer X Games.